This is the lead story on the front page of tomorrow’s The Guardian. 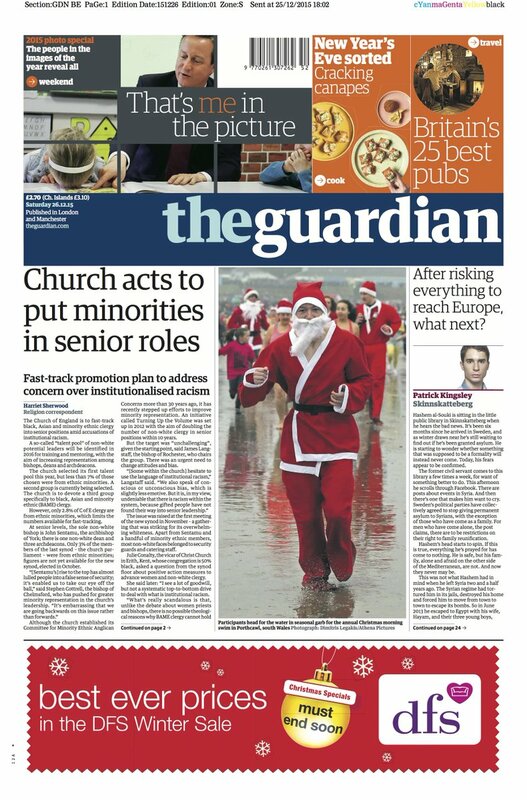 The Church of England is to fast-track black and ethnic minority clergy into senior positions amid accusations of institutional racism. Does this also imply that black and ethnic clergy who are fast tracked into becoming Diocesan Bishops will also be fast tracked, like the two existing women Diocesan Bishops (Gloucester and Newcastle), into the House of Lords and thus leap-frog the likes of Lincoln and Chichester? Or will this happen only if the proposed future black and ethnic Diocesan Bishops are female? The Lords Spiritual (Women) Act 2015 is just that. I really hoped we had seen the back of the language of ‘talent pools’. I thought they were now being called ‘Learning Communities’. Which, curiously, makes them sound like ‘disciples’ – a name I heard somewhere. Well there’s a thought. In the name of equality it might also be not such a bad idea to Fast track openly Gay Diocesan bishops into the House of Lords. But of course, in the first instance, that would mean we would have to Fast Track openly Gay priests into Diocesan Bishops. Alas, the multi-talented Jeffrey John, the ideal candidate, seems to be aboard the slow train as far as a Diocese is concerned. In the Church of England, if you are black or ethnic minority you can now be fast-tracked to office of bishop but not fast tracked into the House of Lords. Women who were slow-tracked for many years are now fast tracked into the Lords on achieving office of bishop. And lesbian and gay people are being back tracked. Whilst bi and trans people can’t even see the tracks. Kevin Holdsworth you have won the 2015-16 Episcopal Quiz hands down. With the same answers you should win it every year until at least 2020. Fr David and Kelvin, precisely. The glaring discrimination in the CoE against gays and lesbians leaps out and smacks most thinking people in the face. My eyes rolled nearly out of my head when I read about the latest fast track. For what it’s worth, probably not much, I could not bear to read Justin Welby’s Christmas message. This might even be unlawful – there are no exceptions for the religious institutions in terms of racial discrimination and this disadvantages white clerics. It is most certainly wrong to positively discriminate in favour of one minority while negatively discriminating against another. So, what about the sin of Homophobia? When will that get a look in on all the excitement about beginning to care for minorities in the Church?